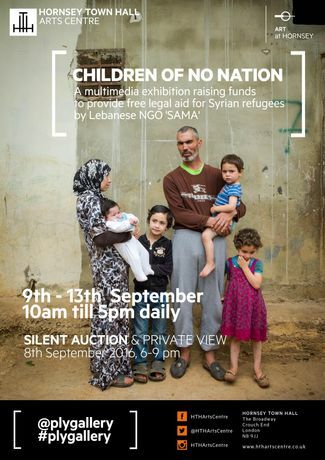 Multimedia fundraising exhibition raising funds to provide crucial legal aid for Syrian Refugees living in Lebanon via an online SILENT AUCTION. Children Of No Nation is the first exhibition to shed a clear light on the risks and causes of statelessness and early marriage for the Syrian refugee community in Lebanon. This is a multimedia exhibition that uses photography by Julian Zerressen, artwork from brocade designer Hannah Nicholas (in collaboration with Kate Dunn), animation work by Xaviera Lopez and audio interviews by Bella Saltiel (in collaboration with SAMA and Tim Sheppard Garcia). Through these various mediums, the exhibition unravels how statelessness and early marriage affect the daily lives of Syrian refugees. It will clarify the link to statelessness, early marriage, and poverty by showing how prohibitive residency restrictions affect livelihood opportunities which mean that costly marriage and birth certificates are unattainable for refugees in Lebanon.